Speed control: The generators may have equal or different engine speeds, but must be locked into the final speed of the system. Load balance: The entire load should be shared by all the generators according to the capacity of the individual units. Synchronization: Synchronization is required to ensure that the resulting output is in phase, has the same frequency and voltage hence compatible with load. Paralleling generators with different characteristics is a bit complex. Apart from the compatibility issues, there are other system level problems the sizes. If the sizes are the same, the system is capable of supporting a higher priority load in case of an emergency. However, if the sizes (in KW) are different, the maximum priority load is limited by the smallest generator; otherwise a higher load will overload the generator unless it is prevented from coming up. In such situations, the control is quite complex and might involve changing the sequence of operation. In addition, manual operation as well as dealing with failure modes becomes difficult. The design should ensure that larger loads are dropped out first in the event of a failure of the bigger generator; this ensures that the smaller generator will be left with a load it can support. This is the process in which the voltage and frequency of the generators are matched to provide a standard AC output waveform. 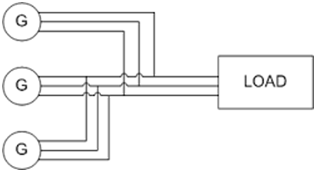 Phase number: The two systems should have the same number of phases, either three or single phase. 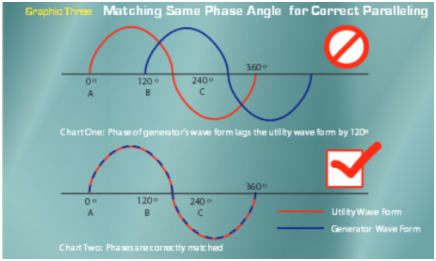 Phase rotation: For three phase systems, each of the three phases must be matched. This prevents excessive mechanical and electrical stresses as well as avoiding power surges. Voltage Phase angle: The waveforms should be matched such that they rise and fall together. There should be no angle difference and the potential difference between the phases should be zero. Increased reliability and redundancy: Improving reliability and redundancy for both critical and non-critical loads. The system ensures that there is always constant power to critical loads, and if one of the generators fails, the load is supplied by the other one or more parallel unit. Low cost of power generation: Cost of generation increases with generator size and is more for ratings above 600KW.This is due to the fact that the market for smaller engines is higher, hence more are manufactures, resulting in lower cost. Using several smaller generators becomes more economical than a single large generator. Decreased light loading of the generator prime mover: In most installations, the load varies from time to time and it is common to have a generator running at 30% of its capacity when the load is low. This may cause wet stacking. The efficiency of the prime mover is normally higher when the load is between 75% and 100%, and a light load means that the generator operation is inefficient. Using a smaller generator increases efficiency, hence a cost reduction. More control and savings on generating costs: The total amount of power supplied from several small generators is equal to the power supplied by one large unit. However, there is more control and balancing in the smaller generators. One can balance the load over the different circuits, and decide on the power to generate at any particular time based on the load. The parallel system can achieve huge savings when all generators are operated above 75% of their rated load. This is the point at which generators use the minimum fuel. Expandability and flexibility: The use of several generators makes it possible to supply a varying load without piling up costly units or spending too much on a big generator whose full capacity is rarely used. Generators can be added gradually as demand increases. Setting up parallel generators is a complex procedure that requires a qualified electrical professional. A well designed system provides backup power and a variable output. Using the correct paralleling switchgear helps the consumer to achieve the maximum output when the power demand is at its peak while providing the minimum output when the load requirements are low. And that’s it! Did this article help? What more can you add about this topic? or copy this trackback: http://engineering.electrical-equipment.org/electrical-distribution/paralleling-generators-synchronization.html/trackback from your own site. May you synchronize either delta or Wye winding generators to the same bus as long as both have the same frequency, voltage and phase angle? Thanks! 1- I have 2 single phase Chinese electric generator 220 v, running 7.5 KW each. I need to run my work with total 14 kw. Can I joint 2 generators wires in parallel and get up-to 15 KW power (Red to Red, Black to Black & Earth to Earth)? 2- I have a supply of 3 phase 4 wires 400 V 50 HZ electricity 5 kw.power. All my equipment are single phase, total power required 15 kw/h. Can I joint 5 kw single phase equipment 220 V to each phase (R with B or Y with B or B with B) to get total 15 kw? If can’t get 5kw from each phase, what is the maximum load can get from this 5kw 3 phase cable? Today there are Auto Synchronizers that synchronize generator and close the breaker automatically. Most of operators are probably not aware of what is actually happening before breaker closed event and after it. My days it was all done manually. Here is a small online simulator that allows user to get some experience by synchronizing an imaginary generator to grid. The generator has no protection as you can’t brake it anyhow. It has a rudimentary excitation and a simple drooped turbine governor. hello pero, where is the online simulator that allows user to get some experience by synchronizing an imaginary generator to grid, can you please share the link or name of simulator with me please? – If they are 30amp each, does that mean it is still a max of 30 amps combined? – Do I need a synchronization panel for this set-up or since they are identical models and both new they can be wired in parallel? i have two generators , 1500KVA each with synchronization panel. when one work wnd then load become more and needs the other to share , the synchronisation taks a long time as much as more than 3 minuts. any body tell me the reason and how to minmize the time. Client needs less than one minut. I am opertaing generators in parallel in a factory ( oil plant) and now users recommend UPS in parallel with generators for max safety of the plant. What problems can I expect in thus parallel operation?